Reviewer Profile – Kim J. 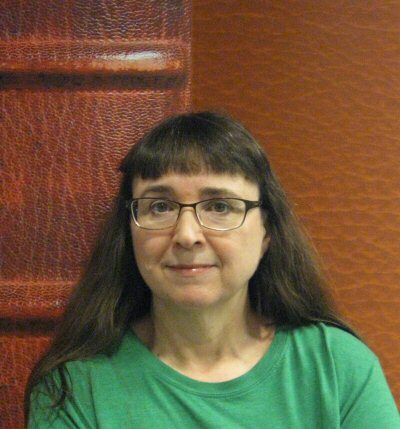 Our featured Reviewer for April 2017 is Kim J.
I grew up in the town of Waverly, Nebraska, so I have lived in Lancaster County my entire life. One of my earliest memories is of a visit to Bennett Martin Public Library with my mother in the early 1960s. I thought the adult fiction area was scary but I really liked the Children’s Reading Room. This was back in the 1960s when the library was much smaller than it is today. My family used to visit the Bethany Branch Library as well. I can remember being excited about getting my own library card and checking out books. I had that little paper card up through college. By the time I was in college, I was visiting the library to use the Polley Music Library and to check out films from the old film department. I have always been a reader since before I started school. My favorite genres when I was young were science fiction and fantasy novels. I read all the Star Trek books I could get my hands on as well as Anne McCaffrey, Ursula LeGuin, C.S. Lewis, J.R.R. Tolkien and many others. When I started Junior High, I started reading the works of Alexandre Dumas, Charles Dickens and William Shakespeare. Those three authors are still among my favorite writers and have had a great influence in my life. When I started college, I added Jane Austen to my list of favorite authors and have read all of her works repeatedly ever since. I am also a big fan of the works of Victor Hugo and C.S. Forester and I love to talk with customers about the wonderful books these men wrote. Sharing my love of literature is what I enjoy most in my career, so books and reading are very important to me! I mainly read books that are in print format, but I also enjoy reading books on my Nook, especially the works of Jane Austen. I also enjoy listening to books once in a while, especially if the reader has an English accent. One of the books I listened to most recently was Martin the Warrior as read by the author, Brian Jacques. I had the opportunity to meet him back in 2002 and found him absolutely fascinating to listen to since he was a master of English dialects. I enjoyed his Redwall Web site very much while he was alive and making posts. I have been suggesting titles on BookGuide since its beginning. I like making suggestions on the BookGuide site mainly because it gives me the opportunity to showcase books that otherwise would go unknown simply because I prefer older classics and genres that differ from most of my co-workers’ favorites. An example of this would be the works of naturalist Helen Hoover (Long Shadowed Forest and Gift of the Deer). Helen Hoover was a scientist from Chicago who gave up city life to live in the Boundary Waters area of Minnesota near the Canadian border. If you are interested in nature, flora or fauna, I highly recommend her books. I started working for the library in 1985 as I was finishing my undergraduate degree at UNL. One of the advantages of working in a library setting is that you are exposed to all kinds of literature that you wouldn’t read otherwise. I taught English and music in the Lincoln Public Schools for a while, but ended up back at the library after finishing my Master’s Degree in Education. One of the things that I missed most while away from the library was working with people who are passionate about books and love to share their love of literature with others. I was hired to work in the Northeast Libraries but moved downtown to Bennett Martin Public Library’s Reference Department just a few months later. The Reference Department was the perfect job for me because I love to do research and I enjoy helping people. I have been in the department for over twenty years now. I have met several children’s literature authors and enjoyed talking with Brian Jacques, Helen Lester and Rosemary Wells. If I could meet any author, dead or alive, I would like to meet Laura Ingalls Wilder. I have visited all of her homes (or sites) over the years, and read many books about her and her writing. I think that she made a huge impact on the field of children’s literature with her books, and still read them as an adult.